Economic tensions, nuclear and EMP threats, and acts of terrorism, both domestic and abroad, have people concerned about their safety and survival. 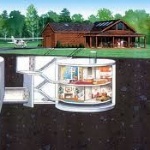 During the Cold War, bomb shelters or fallout shelters became very popular. Today, your own home can provide the protection you need from whatever threats about which you are most concerned. Jason Hartman is joined by Brian Camden, Principal of Hardened Structures Hardened Shelters LLC, to talk about fortified homes, underground bunkers, protection and action plans, and how many shelters are designed. Brian explains the construction designs and the level of security available. These hardened structures can be built as a nice-looking home or second home or as an addition to an existing home, most often with underground shelters, that are fully sustainable off the grid. Brian shares some of the most important reasons that more and more homeowners are requesting fortified homes or shelters. For more details, listen at: www.HolisticSurvival.com. Hardened Structures Hardened Shelters LLC is a Construction Program Management firm (http://www.hardenedstructures.com/). The Team consists of a core group of independent, specially trained shelter design firms for structural engineering, blast engineering, EMP/HEMP shielding, CBRN, HVAC, electrical and alternative energy designs. There has been a lot of concern about how unprotected our nation is from EMP/HEMP blasts, whether from natural means like solar flares or from warring nations, and the company has been involved in a lot of military projects to protect from these threats. All construction is performed by a special group of geographically specific licensed general contractors. These independent design firms and general contractors have had specialized shelter design and build training before they can become part of the “Hardened Structures Team”. The company provides a “one-stop shop,” including arms, alarm systems, training, security threat assessments and more.